ESRI has put out this great “Geography of Horror” map, just in time for Halloween. It’s a map of where the top rated horror movies (about 250 of them) take place. You can explore the the locations via decades of movie releases. This kind of thing brings up questions I wish I had time to explore. How do horror movies influence the perception of location? What geographic characteristics contribute well to horror? It would also be interesting to try and find remakes that have been done of movies and compare how the locations play a role in each story. For example, compare The Ring (2001) which takes place in Seattle, with the original Ring (1998) set in Japan. SPOILER ALERT: I’m talking a lot about characters and plot points in The Walking Dead Season 3, Episode 12 “Clear.” I don’t intend to give anything away, but if you want to stay surprised and haven’t watched season 3 yet, you might want to bookmark this post and come back later. I strongly believe that geography skills will be a major benefit in the zombie apocalypse. So I’m always excited when I notice characters using those geographic skills in zombie stories. In the 3rd season of The Walking Dead, Rick, Michonne, and Carl go for a supply run. 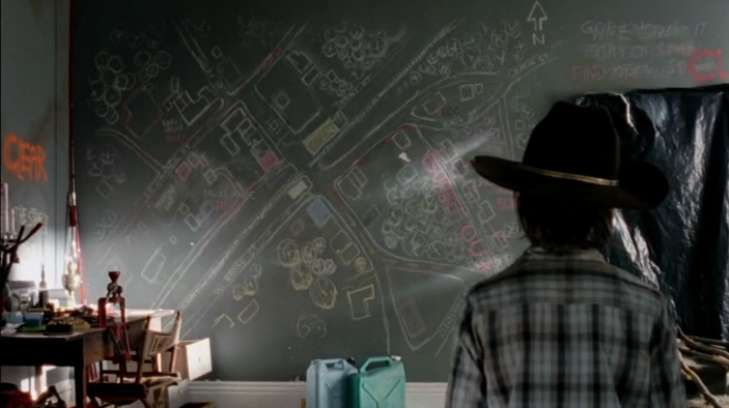 They run into Morgan who has been holed up in Rick’s old neighborhood. Morgan was surviving all on his own and he did so by setting up some elaborate traps all over where he was staying. Something else that helped him survive was mental mapping. The mental map is probably not completely accurate. However, it gives good insight into what the person who drew it remembers or finds important. First of all, I want to congratulate Morgan for making a quality map. We can see that he included direction in the top right, showing which way is North. We can see that he used many clear symbols for roads, trees, houses and other buildings. He also used labels, which we can see when Carl examines closer. It is hard to tell if it is to scale, but judging by the relative size of the buildings, it is probably accurate enough for Morgan’s needs. It is a valuable skill to analyze someone’s mental map. 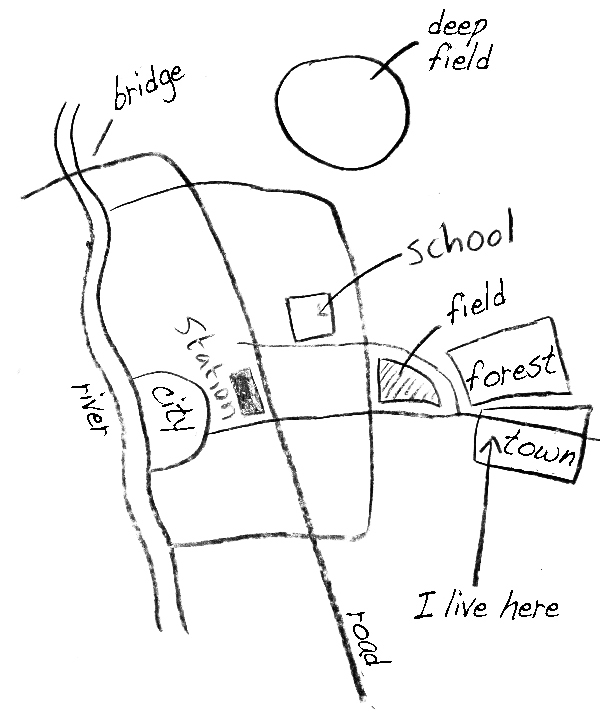 Through this analysis, we can tell what was important to the mental cartographer. It appears that Morgan has been keeping track of which houses are “Taken” or “Burnt Out,” possibly even which areas are “clear.” It is definitely important for Morgan to keep track of which areas are overrun and which areas are safe enough to journey into. But even more interestingly, try to determine what Morgan thought about Rick. Morgan may be good at mapping, but not so good at using apostrophes. 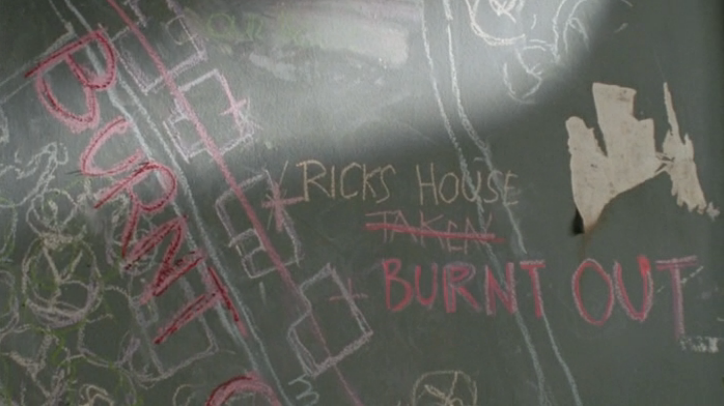 Morgan kept close track of Rick’s house. You can see that he updated it to being “TAKEN” and then to be “BURNT OUT.” Morgan didn’t seem to keep as close track of any other houses. This might mean that Morgan was still thinking about Rick, caring about the state of his property, and caring about the state of Rick. Morgan took part in another important skill in mental mapping; he updated his mental map. As you learn more about locations, you should keep updating the data on your mental map. We can see that Morgan crossed out and added new labels, making updates as they were needed. Similarly, when you learn about the world around you, you should update your understanding of the world. 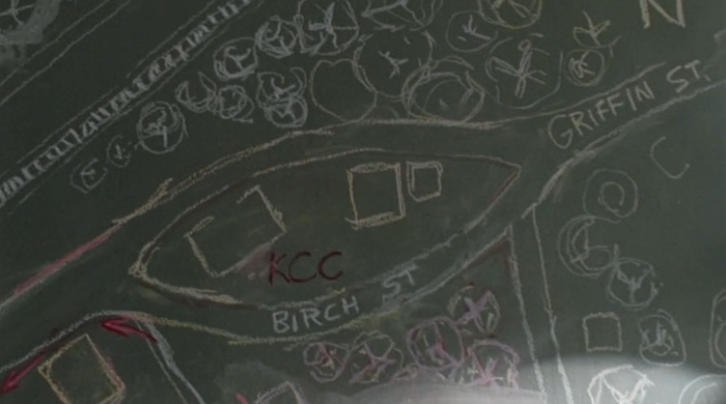 In the zombie apocalypse mental maps become very important. We lose access to map references and need to rely on our mental maps. Morgan did a good job keeping his mental map up to date and that probably kept him alive. However, it didn’t keep him sane. Check out this image showing world population density. How does this information influence where you will go when the zombies spread?